Artist Peter Frantz was born in Tyrone, PA and subsequently joined an extended, eclectic family of artists and musicians. He attended the University of Notre Dame, Goddard College and attained his Master of Fine Arts from the Pennsylvania Academy of Fine Arts. A professional writer and artist his entire life, he is also the co-founder and Executive Director of Panzi Foundation, a non-profit that raises awareness about the conflict in the Democratic Republic of Congo. Frantz is the primary artist and curator for a continuing series of exhibitions entitled “Peace Should not be This Fragile: A Portrait of Panzi”. Frantz is an artist whose work emphasizes the use of drawing, digital images and sculpture in creating his narrative, and his three-dimensional art employs man-made and natural materials, such as tree roots, glass and cast bronze. In his search to understand who he is and where he fits in a universe of wonderment, Frantz shares his talents and techniques with the next generation of artists as an adjunct professor of drawing and sculpture at Towson University in Baltimore, MD. 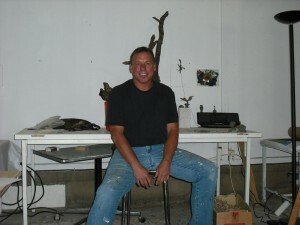 His work has been widely exhibited, both nationally and internationally.